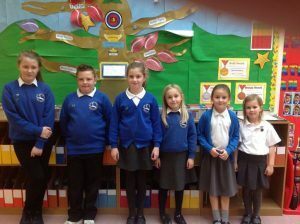 We are the Eco Committee of Black Lane School. We help to encourage everyone to look after our environment by following our Eco Code 2017. We have achieved the Bronze Award and the Silver Award in recognition of the work we already do towards being an Eco School. We are currently working towards achieving our first Green Flag. We have involved the whole school in carrying out an Environmental Review to find out what we do well and what we need to do to improve. Please see our Environmental review. 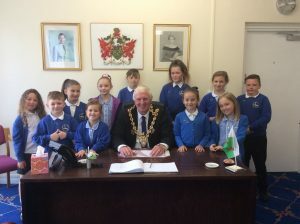 18th May 2018 – We visited the Mayor’s Parlour with the School Council to meet the Mayor Mr John Pritchard. We used the public bus and practiced asking and paying for a return ticket to Wrexham. 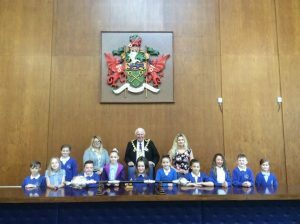 We sat in the chamber room and pretended to hold a council meeting. This year the Eco Council have decided to organise an Eco Week instead of an Eco Day. The Eco Week aims for all classes across the school to cover activities under the 9 Eco-School topics and will focus on areas identified in our Environmental Review. We did it! 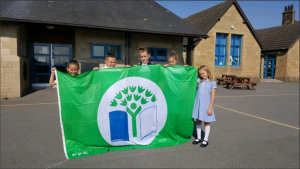 We have been assessed this week (9th July 2018) and we have been awarded our 1st Green Flag Award for our efforts and work towards being an Eco School. We would like to thank the staff, parents and children of Black Lane for working as a team to support and promote our Eco School projects. We are very proud!